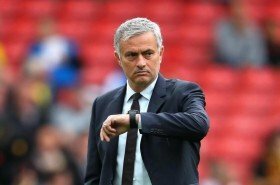 Manchester United's hierarchy are understood to have no plans of parting ways with Jose Mourinho despite the club's struggles during the first half of the season. The Portuguese tactician has been under immense pressure since the start of the campaign with United struggling to build a winning run, and the club are presently 11 points behind the fourth position in the standings. Despite this, The Mirror claims that Mourinho's position in the dugout remains safe and the 55-year-old will be given time to turn around the club's fortunes during the festive period. United are currently experiencing their worst-ever season in the Premier League era but they have the opportunity to revive their campaign in the forthcoming weeks where they have a favourable run of games. Mourinho's side are scheduled to face Cardiff City, Huddersfield Town, Bournemouth and Newcastle United in the next four matches and the fans will be expecting their team to go on a winning streak which has been a rarity this term.